At the time of Thomas’s baptism, on February 2nd 1890, his parents were living at 37 Parkes Street and his father, Thomas Edward, was registered as an attendant at Warwick Asylum. At the time of the 1901 Census, Thomas was living with his father and two younger brothers (Donald, 9 and Charles, 6) in his Aunt Margaret’s house at 32 Lower Cape. His aunt was registered as a Laundress on her own account, from home. ‘I never knew of the existence of my grandfather’s brother. The family never mentioned him. Then I saw the name T. W. Andrews on the Warwick War Memorial. As my grandfather was an Andrews I wondered if there was a connection. 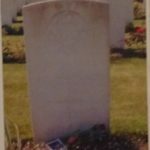 I contacted the War Graves Commission and their records showed he was my grandfather’s brother and was killed in Action at Meteren, on the French/Belgian border. The Great War started in August, so he did not survive it very long. He was my great uncle, so I went to Meteren to see his grave. Meteren is a small town with Victorian houses, like those on the Cape, Warwick, where he was born. Perhaps this gave him some comfort. The War Cemetery is part of the Town Cemetery and very well maintained. Thomas has his own grave and headstone. We left a few tears and some roses, with a photo of his great-nephew, Thomas William Knowles, who, unbeknowingly was given his names. At the time of the 1911 census, Thomas was listed on the census return for the military personnel serving in Ceylon and India.